Observed on a farm in Kamwenge, Uganda. December 2012. Black-headed Herons often hunt for prey in fields devoted to pasture or farming. They are large, about 85cm tall on long, dark, slender legs. The large bill is gray and very sturdy for spearing amphibians, small mammals, reptiles, large insects and fish - i.e. 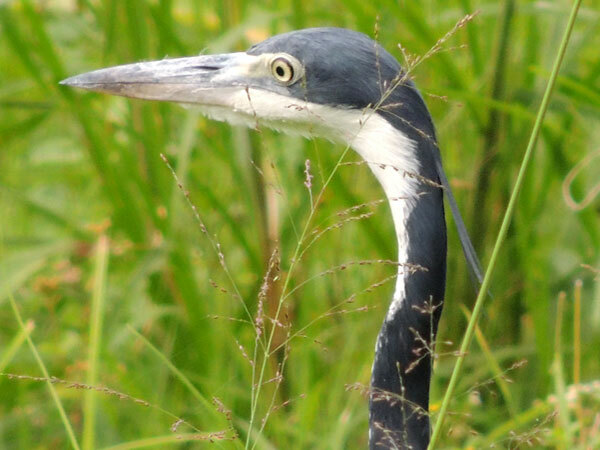 the Black-headed Heron is an oportunistic predator. These birds are common and widespread through much of Africa south of the Sahara, including Kenya. Copyright Michael J. Plagens, page created 11 June 2013.